Wud up ya’ll. Today we’ve got some cool underwater octopus design vectors, and guess what… they’re free! What a surprise. 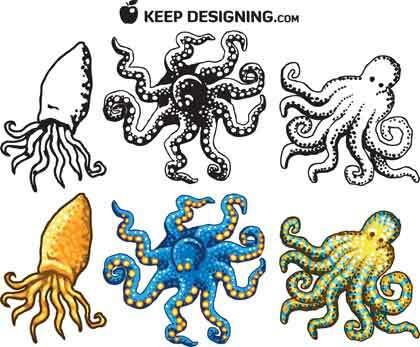 This free design download contains six octopus designs, actually there are three designs, each with a color and black/white version. These are friendly vector illustrations useful to anyone running adobe illustrator 8 or higher. These are copyright designs that can be used on any personal or commercial work. 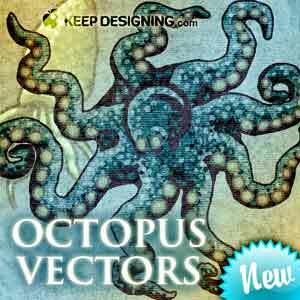 CLICK HERE TO DOWNLOAD “OCTOPUS VECTORS” FREE. These octopus vectors are awesome- thanks for sharing the love. Thanks for all the great freebies! I loved these octopus ones so I posted a link to them on my site. Hey thanks Vanessa! I like the header on your blog, nice lighting on that classic pattern. Cool, thanks! I do a lot of sewing, and a little boy down my street (he’s 5) wants me to make him some stuffed toys of jellyfish, sanddollars, octopi, squid, fish in general…. I’ve been looking for some images to use to figure out how to make a somewhat real looking toy, and these look great. Thanks again! That’s awesome Lauri- glad these octopi vectors could help. Thanks so much for the awesome freebies! You do great work!